So called solids, a photo by Venus In Furs on Flickr. Ollie's doing great. He's a big healthy baby boy, slightly bigger even than his brother was at this age. He's been gaining about 2 pounds a month and is currently busting out of his 3-6 month clothing, though most of his 6-9 is a little big yet. 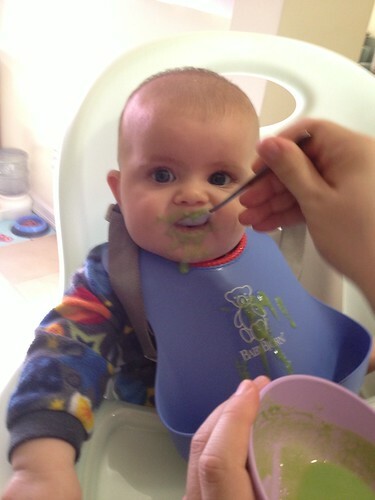 We've tried to introduce mashed sweet peas mixed with milk into his diet, but he's not really into it. He mostly pushes everything we get into his mouth back out with his tongue (he does the same when we give him his vitamins, and any medicines). So we'll keep trying, but we're not forcing the issue. For now he's thriving on just breastmilk. He hasn't gotten any teeth yet, but I expect to see them every day since drool runs from his mouth like a leaky faucet and he seems to be experiencing teething pains. I am actually surprised every day when I rub his gums and don't feel a sharp little tooth poking through yet. Oliver has come a long way from the fussy gassy tiny little thing that came home from the hospital with us on my birthday. It turns out that he is quick to giggle and smile and laugh (he laughed at a much earlier age than his brother) and there is little more he loves than watching Gibson play and sing. He's very alert and the way he leans towards his brother it seems that he can't wait to get up and join in the fun.